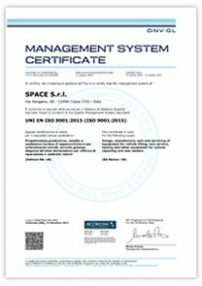 The quality certification system according to UNI EN ISO 9001-2008 is a confirmation of the ability to design, manufacture and to provide aftersales service of SPACE S.r.l. 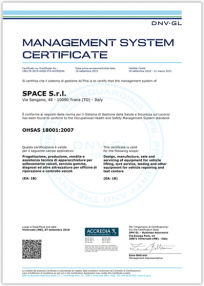 The quality of the training is a key strategy in SPACE S.r.l. The training courses for technicians and sales staff are held in the training center specifically created at the plant SPACE, which includes a demonstration room. The test lanes of SPACE are approved by the ministry of transport in many countries, such as Italy, France, UK, Netherlands, Russia and Hungary.